At the beginning of the Revolutionary War, Saugerties was entering the height of its earliest community development and the names of its leading families are those that will play a part in the protests, rebellion and recovery for the next quarter century. All were landowning Freeholders of the Kingston Commons. The majority found themselves residing and farming on disputed lands after the Crown grants of 1767. For this reason this community was one in calling the taxes and other economic Acts of England tyrannical and joining the protests that made England declare its American colonies in rebellion. Following the Unanimous Declaration of the Independence on July 4th, 1776 an army of 32,000 English and Hessian soldiers landed on Long Island and occupied New York City. Cut off from the sea, the Kings Highway and Kingston, the most important location on it, became the route and destination of all communication and commerce between the rebellious colonies. After the independent State of New York elected a Governor in June of 1777 England called for its armies of the north and those in New York City to join at Kingston, destroy the seat of the new government, occupy the whole of the Hudson Valley and split the colonies in two. When the army of the north surrendered at Saratoga the British fleet had already burned Kingston, Livingston’s Clermont and other houses along the shore around Saugerties before retreating back to New York City. The army that had fought at Saratoga, marching south to Pennsylvania along the Kings Highway, was greeted at Kaatsbaan Church by the homeless families of Kingston with a great feast to celebrate their victory. Afterward, as they passed the ruins of Kingston’s beloved Dutch church and the remains of the homes of this once-prosperous place, that memory would strengthen their resolve and see them through the many hardships they would suffer in the winter that followed at Valley Forge. Saugerties, together with Hurley, Marbletown, New Paltz and other places that had grown out of Kingston’s seed now had to feed and shelter its homeless population for that harshest of all winters and then until its homes could be rebuild. This played a decisive role in reinforcing the settlement patterns of these host communities, especially in Saugerties where so many of the third and forth generation Dutch had already made their homes. Kingston had become a center of great wealth. Its houses were the showplace of those that controlled the most productive lands in the Hudson Valley. Many also owned houses in New York City that the great fire there had destroyed the past winter. After the burning of Kingston an entire class used to comfort was forced to live in the rough dwellings built for their slaves and farm workers on their plantations or to seek charity in the frontier homes of their friends or relatives. In these homes there was a constant threat of raids and even fear of a full-scale invasion throughout the winter. An army of Indians and loyalists were pressing throughout the Catskills recruiting leasehold farmers with promises of ownership grants to their farmsteads. A Tory fort built atop the Plattekill Clove controlled the peaks and looked down on all the land of Saugerties, the Hudson River and a smoldering, deserted Kingston to the south. By 1773 the budding village of Saugerties already had Christopher Kiersted in residence as its doctor. He lived in the stone house built by his wife’s grandfather Hizakia DuBois. After the burning of Kingston his house and that of his neighbor, Edgar Schoonmaker who had just returned from the battle of the north, as well as other dwellings in the vicinity filled up with relatives from these early Kingston Dutch families and others they could give charity to as the winter approached. On February 17, 1778 Governor Clinton exempted “artificers” (carpenters and masons) from military drafts and duty who were available in the spring to start rebuilding Kingston. Many of these artificers came from the Snyder and Myer families of Churchland. Johannas Snyder had earlier built the stone “hospital” for housing the troops during the French and Indian War and the entire Snyder family were skilled carpenters and stone layers. The stone houses built by the second generation of the Christian Myer family were landmarks along Kings Highway and into the village of Saugerties well before the Revolution. It is not until 1781 that militia responsibilities are again placed upon the Myers and many of the Snyder family indicating the time it took to finish the rebuilding of Kingston. The frontage of Saugerties on the Hudson was vulnerable to the traffic on the river's broad and deep sea level channel and its western bounds were vulnerable to the mountain overlooks and the enemy encamped behind them. But the middle terrain of Saugerties with its raising bluestone ledges made it equally defensible against these threats. Saugerties’ single most important asset was the sweeping views that, in this time of threats of Indian raids from the Catskills and military invasion from the Hudson, permitted a watchful community to feel informed and secure. Just as the high escarpment of the Catskill mountains allowed the Tory fort to keep a watchful eye on the activities of Saugerties, the high hills between the Catskill wall and the river offered equally strategic views of both the mountain and the river. From atop Mount Marion a view of the river as far as the Highlands and, on a clear day, through the Highlands to Manhattan could be had. These same high hills also represented a significant, defensive barrier to east-west and, at critical points, north-south overland traffic. Where these barriers opened their few natural passages, Saugerties formed its settlements. In this way it effected the points of traffic and insured both its security and that of the larger community of Kingston. These passages grew after the burning of Kingston to rapidly became control points as well for commerce. Compact groupings of stores and houses were built to support the traffic that passed through them. After Burgoyne’s surrender, Vaughan's retreat and the moral boost of Washington’s victory at Trenton the British offensives of the Revolution War turned toward the southern colonies. In New York their tactic was to directly threaten the homes of the rebels with raids from their Iroquois allies. Defense of the Saugerties Region was the responsibility of the First Ulster Regiment led by Col. Johannis Snyder. Three companies were formed in the north, south and west. These centered on the Saugerties landing, the Kaatsbaan and the Blue Mountain districts. A special group was selected to “range the frontier” along the base of the Catskill escarpment. A “fort” or rallying point for this group was at the northern of the two Tobias Wynkoop stone houses built at each extreme of the road that led to Blue Mountain from the Kings Highway. 40 militiamen under the command of Captain Jeremiah Snyder began in 1778 to patrol from the Kaaterskill Clove to Shandaken. In that year a fort was commissioned by Congress at Shandaken to support a 150-man garrison with Colonel Johannis Snyder in charge. At the other extreme of this patrol route the stone house of Tobias Wyncoop was fortified as a frontier garrison. By 1778 the British had established a network of trails their Iroquois allies used to raid the Hudson and Delaware valleys. These led from the upper Susquehanna through the high Catskills valleys and down the Esopus. In the summer of 1779, the Continental Army, under Generals James Clinton and John Sullivan took a successful campaign to the Indians of central New York, destroyed their villages and crops and left them with no food or shelter for the severe winter that followed. By the spring of 1780 the bounties that the British paid for captured Colonial officers was attracting bands of desperate Indians into the Hudson Valley. Many officers of the Ulster militia were abducted for ransom at this time. These abductions are among some of the most told stories of the Revolutionary War period in Ulster County. Captian Jeremiah Snyder and his son Elias were kidnaped in May of 1780 from their farm fields and taken to Canada. The Snyders were captured in fields close to the present location of the Saugerties Reservoir. Peter Short and Peter Miller were captured at the present location of the Saugerties/Woodstock border on old State Rt. 212. The full story of the capture, captivity and escape of Jeremiah Snyder and his son was told, first hand, for the fiftieth anniversary of the Revolution, by an 89 year old Jeremiah Snyder. Published in 1827 in a Kingston newspaper, it has been retold in its entirety in many books including Evers' "The Catskills" and Brink's "Early History of Saugerties". Independence arrived for the Hudson Valley on November 25, 1783. On that date the British evacuated New York and once again the Hudson River was open to commerce. Throughout the seven years of the Revolutionary War the agricultural production of New York maintained a stable level of output. Trading, to a limited extent, also continued. New York was so split in its loyalties that there was always a market for its products. Tories supplied the British in the city of New York and continued a high level of commerce with the British possessions in the Carribean. Whigs fed the Continentals in the interior. Whether Whig or Tory the wealthy of New York were wealthier at the end of the Revolution. However much of the usefulness of the wealth was limited by the debt the State of New York and the Congress of the United States incurred for the Revolution. The wealth of the Nation was based on trade. New York landowners and merchants had plenty of wealth to invest in trade but it was in unsecured soldiers pay certificates and state and federal securities. With barriers to trade in place due to British sanctions the wealthiest used their liquid capital to speculate in war-era certificates and used these to buy large estates confiscated from landed Tories. What certificates were left over would fuel the politics that would have a curious effect on the destiny of Saugerties. At their regular first Tuesday of March annual meeting in 1783 the Trustees of the Corporation of Kingston passed a resolution to offer one square mile of land to the Congress of the United States to place the Capitol in Kingston. In July the Trustees were informed of the offer of the Corporation of Annapolis in Maryland and countered directly to Alexander Hamilton with a two square mile offer on September 23, 1783, sweetening the deal with the transfer of a valuable lot on the shore of the Rondout Creek at Twaartskill into his name. Throughout the 1780’s until the final cession of ten square miles by Maryland on the 23rd of December, 1788 the desires of the powerful political interests of New York to retain the Capitol in New York State continued to be played out through the Trustees of Kingston. It is said that in the end Secretary of the Treasury Hamilton bargained away a Capitol in New York in exchange for Congress assuming the war debt of the States. The offer of the Trustees encompassed an area of Commons lands along a Hudson River frontage long known as Flatbush. Later the central piece of this offer would be included in the division map of the commons as a grant by the Trustees to benefit the Kingston Academy. The bounds of that particular lot fell squarely in the southeast corner of Saugerties. The reason that the Capitol of the United States is not found in Saugerties is therefore because there was a greater need for a Federal government with a good credit rating. The full story of Saugerties’ involvement in the events surrounding the burning of Kingston and Clermont is clouded in the mists of time. Very little documentation remains. Still, it is interesting to study the events that surrounded the brief mentions that there are and from them try to develop a story of that period between October 18 and October 23, 1777, when thirty ships of the British fleet sat off Saugerties and the only engagement in the Revolutionary War in the Hudson Valley occurred. General John Vaughan and Sir James Wallace were the chief British officers of this fleet. They had on board over 2,000 troops. It had been their mission to continue a diversion up the Hudson giving Burgoyne and St. Leger, the British commanders of the northern campaign, the opportunity to meet, take Albany, and secure the Hudson Valley to split the rebellious colonies in two. The Hudson command was under Sir Henry Clinton, in New York. The Fleet was under Commodore Hotham and the entire British campaign was under Vice-Admiral Lord Viscount William Howe. Vaughan's expedition up the Hudson River was made possible after the British forces from New York City, on October 6th, 1777, captured Fort Clinton, Fort Montgomery and Fort Constitution. These forts had protected a great chain placed across the river to impede navigation. This chain was made in Kingston between late August and October 1776. Robert R. Livingston supplied the iron for it. On the 11th of October 1777, Sir James Wallace took a small mission up the river as far as Poughkeepsie to gage resistance. The full expedition commenced on the 14th when Vaughan's fleet of 30 vessels left Peekskill and sailed up to an anchorage just off (A) Esopus Island. Ahead of this fleet the only colonial war ship on the river, the galley "Lady Washington" proceeded into the Rondout Creek. Taken up to the falls at (B) Eddyville, she was dismantled (armaments removed) and sunk. The loss of knowledge of the location of this highly maneuverable threat confused the defensive plans of the British for their entire stay up the river. On the morning of the 16th the fleet passed (C) Kingston Point. Once Hessian mercenaries had broken the defenses of a militia under Johannas Snyder and Levi Pawling at (D) Ponckhockie, the full British land force of 2000 disembarked near (E) East Kingston and marched (F) two miles inland. On the afternoon of October 16, 1777, at 4:00 they burned (G) Kingston. In contemporary newspaper accounts the extent of the destruction was that all was burned except the house of Alderman Lefferts of New York. The entire population had moved themselves and their valuables, under the direction of Governor George Clinton, to (H) Hurley the day before. Kingston was deserted when it was destroyed. Governor Clinton reserved his small force exhausted after a forced march after the battle of Fort Clinton. They remained at Marbletown to protect the records of the State of New York which had been moved from Kingston to Rochester. On the 17th, in the morning, the British went onto the east bank and burned houses and barns around (I) Rhinebeck. That afternoon, against a stiff wind from the north, the entire fleet fought its way up to an anchorage just north of the (J) Esopus outlet at Saugerties. A letter from Wallace written from "Livingston's Mills" on the 18th gives two important reasons for this move. First is the indication that they are anchored in the heart of the rebel Livingston lands. Second is the content of the letter stating that the fleet did not feel secure near the Rondout because they had not been able to locate and destroy the rebel galley. Meanwhile, to the north at Saratoga, Burgoyne, after ten days of negotiations with Major General Horatio Gates, the colonial victor, had finally signed a surrender of the British northern army. He was forced to surrender because his sister force under St. Leger was defeated in the Mohawk Valley and his own supplies had been cut off by a colonial victory at the battle of Bennington. The news of this situation had reached the colonial leadership before it reached the British. Governor George Clinton knew of it on the 15th and had it "leaked", through a Tory resident of Kingston, to Vaughan early on the 16th. This knowledge, whether not believed or ignored, did not stop the burning of Kingston. Governor Clinton wrote a letter to General Gates on the 17th complaining of the slowness of the resolution of the surrender. There was a threat that any delay may mean a movement of the fleet, one day's sail from Albany. The surrender was signed on the 17th. It is unlikely that Burgoyne knew of the closeness of Vaughan, anchored off Saugerties, when he surrendered. It is further unlikely that Vaughan had any way of gaining intelligence on the position of the forces at Saratoga without sending a scouting party up to see for sure. This is probably what occupied Vaughan during those five days at Saugerties. Sometime after the 19th of October, General Gates sent a rowboat, with Lord Petersham of Burgoyne's army, to carry Burgoyne's dispatches to Sir Henry Clinton. These conveyed the terms of the surrender. Gates knew that the fleet was at Saugerties and so aboard this boat he sent a personal letter, dated the 19th, to Major General John Vaughan. In this letter Gates severely reprimands Vaughan and the intentions of the "Royal Cause" for the burning of Kingston and warns him of reprisals. This dispatch boat and letter must have brought the first official word of the surrender at Saratoga. They would have met the fleet at Saugerties no earlier than the 20th or 21st. It is quite likely that Lord Petersham, and the dispatches, returned to New York in the comfort of Vaughan's flagship, and that the entire fleet turned and returned to New York immediately upon having the surrender confirmed. The fleet set sail early on the morning of the 23rd, spent the night off Kingston point and rejoined the flagship of Commodore Hotham at Peekskill on the 24th. These are the events that led to the retreat of the British Fleet at Saugerties. But, during the five days that it was there, what took place? Why is there no indication that Saugerties was burned and why was the anchorage of the fleet referred to as Livingston's Mills. In a dispatch from Vaughan of the 18th of October the place is maliciously referred to as "from on Board the 'Friendship', off Livingston's Mills that were Saturday, Oct. 18, 1777, morning, 10 o'clock." The words "that were" are underlined, indicating that the mills had been the first properties to be destroyed on the fleet's arrival. Were these mills in Saugerties? On the evening of October 17, 1777, 30 vessels of the British fleet were anchored on the Hudson River (J) at Saugerties. The River between Magdalene Island south of Tivoli and the West Camp at Saugerties was filled with them. Tivoli, at the time, was called Hoffman's, or Hostman's Ferry. That ferry crossed to the Saugerties landing on the Esopus. Another ferry crossed from the Mynderse Road south of the Sawyer Creek to Clermont wharf. The stretch on the Hudson between these two ferries was referred to by the commanders of the British fleet, General Vaughan and Sir James Wallace, as "Livingston's Mills". The name "Livingston's Mills" is probably a reference to the elusive powder mill that Judge Livingston had built for supplying a Whig army after the Stamp Act riots in New York. The word "Mills" in this name, however, refers to more than one mill. Since mills of the day were run on waterpower and there are more streams at Saugerties than on the east side of the river at Clermont, "Livingston's Mills" is presumed to make this general location Saugerties. Kingston, ten miles to the south, had been burned at 4:00 in the afternoon on the day before. Little other destruction had taken place on the River south of Kingston. On the 17th the fleet sailed to Saugerties where it immediately began to destroy Livingston properties. A diary account of this destruction, kept by William Smith, a Loyalist friend of the Livingston family, tells which buildings were burnt. In addition to (K) his own house; the “house and appendages of Judge Smith”; on Friday, the 17th, the house (L) of Robert G. Livingston, the Buildings (M) of the widow Ten Broeck and the mill (N) of the widow Livingston on the Sawyers Creek were burned. On Saturday, the 18th, the houses of Robert R. Livingston and his mother (the 1730 Clermont manor house (O) and the one recently built (P) near by) were burnt, the house and buildings (Q) of Nicholas Hoffman (probably storehouses by the ferry) were burnt and (R) "On the opposite side several houses are burnt there". This eyewitness account would seem to place the bulk of the destruction of houses and mills; in effect the largest destruction in the entire campaign next to Kingston; in Saugerties itself. When Smith's account is added to the newspaper stories of the burning of two houses (S) on the 22nd and a sloop in a boatyard (T) burned on the 23rd, also on the west side, the evidence of purposeful destruction waged against Saugerties is yet greater. It is understandable that the sensational burning of three hundred and twenty-six houses and an equal number of barns in Kingston on the 16th of October would naturally tend to overshadow the destruction of comparatively few mills and houses in Saugerties over the week that followed. The Whig and Loyalist newspaper accounts of the day only mention the destruction to the north because of the notoriety of Robert R. Livingston and his late father's powder mill. Without this the destruction of the 18th through the 23rd may have been ignored altogether. What was the real purpose of this destruction? With Saugerties being an active Livingston landing, a ferrying point, the terminus for three key colonial wagon roads and, as indicated, the location of considerable improved water rights in which Livingstons had an interest, it is only logical to assume that vengeance against Livingstons was the reason for widespread destruction there. However, there is one fragment of history that, when placed into the context of the events at Saugerties, makes Vaughan's activities for these five days there perfectly clear. Saugerties may have been Vaughan's destination all along. There is evidence that General Burgoyne had planned to use Kaatsbaan (U) as an encampment area for the British Northern Army. From there he would secure the Hudson Valley. It was therefor essential for the British fleet to be at Saugerties, take the landings there and assure a safe supply route for the land troops from the deep channel on the shore at West Camp (V). Thus, the logic for all of the destruction, including Kingston, was the demoralization of the civilian community. In this region known for its rebel sympathies and leaders such a plan could not tolerate a hostile populace. The constricted landscape of Saugerties, the shortest distance between the Catskill wall and the Hudson, was of great strategic importance. Governor Clinton recognized this in a letter to General Gates stating that his militia could not defend artillery there. Saugerties was not defensible with the river lost. Supported and supplied from the river, the British could safely command from Saugerties with a minimum of defensive manpower. By the 22nd of October final confirmation of Burgoyne's surrender left Vaughan's fleet with no reason for remaining at Saugerties. Kingston had been destroyed to sweep all resistance from the path of the armies of Burgoyne and St. Leger in the population center of the Hudson Valley. When these armies were defeated before they could even reach Albany, the Hudson Valley exploits of Vaughan were left as a petty and meaningless campaign of simple marauding vengeance in history and the tactical importance of Saugerties was lost in the mists of time. Following the burning of Kingston Saugerties became the principal hub of traffic along the Kings Highway as goods traveled south to the middle colonies that would have been moved by water if it were not for the British control of the lower river. Its highway districts totaled ten out of the 22 of the entire Kingston Commons and all centered on the Hudson River landings at Saugerties. The ferrying point there linked the land routes on both sides thanks to the Livingston’s Clermont directly opposite Saugerties and its need over the preceding decade to ship as well as receive products at the deep channel of the river on the Saugerties side. This increased activity gave rise to a nucleus of taverns and merchant businesses on the level grounds above the landings. Some were well established by the time of the Revolution. These oversaw the movement of materials needed to rebuild the destroyed houses, mills and warehouses of Clermont as well as those of Kingston. Robert R. Livingston helped rebuild Kingston in addition to making a gift of land in his Hardenburg patent to those who suffered losses there. Business centered on Saugerties mainly because of its relationship to the Livingstons. The main figure among the businessmen of Saugerties was the tavernkeeper Abraham Post who had long been held in the highest esteem by the Livingstons for his knowledge of the mountain trails, mountain resources, inhabitants and Indians. He was considered a confidant and advisor to the elder of the Livingstons and from the first outbreak of the Revolution, the tavern of Abraham Post became a center for information on the course of the rebellion. It was a signing place for the Articles of Association and was in the whole of the Commons considered the safest and most reliable information access point for patriots since the younger Robert R. Livingston was a key figure in the Continental Congress and conducted his business at Post's. After 1777, when he became Chancellor of the newly formed State of New York, the association between Livingstons, the patriot cause and business in Saugerties became even more firm. After the Revolution, in 1792, Robert R. Livingston, then Chancellor of New York and Secretary of State of the United States, established an even stronger commercial foothold in Saugerties. He took possession of all the landings around the Esopus outlet and all the land with road access to these by financing the settlement of the estate of Barent Burhans' for John Brink Jr., son-in-law to William Burhans, in 1790, and then purchasing the entire estate from Brink except for a small farm that was later deeded to Livingston in 1806. The Livingston family had a long association with the Burhans and Brinks. William Burhans operated the mill on the falls of the Sawyerkill where the Livingstons traditionally carried out their industrial activities. This was the Livingston Mill burned by the British in 1777. John Brink, Jr. lived near this mill and for many years kept the ferry that crossed the Hudson to Clermont Manor. Materials from the mill and from tenant rents on the Livingston lands around Woodstock and Shandaken went to the Livingston warehouses on this ferry. By the 1790's John Brink, Jr.'s son, Andrew, was operating the sloop "Maria" that carried most of the Livingston wares and products to the New York markets. Andrew was later, in 1807, the first captain on Livingston and Fulton's steamship, The Clermont, and took it on its maiden voyage from New York to Albany and back. That land of Barent Burhans has an interesting history. Much of this land was within the portion of the Meals and Hayes patent that was conveyed by John Hayes to John Persen in 1712. In 1740 the heirs of Barent Burhans petitioned the Kingston Commons to release a deed to them for property that their father "in his lifetime was possessed or entitled unto". The bounds of the land in this deed, aside from being called a part of the Meals and Hayes patent, were not defined at all except to say that they were "lying at Sagorties". 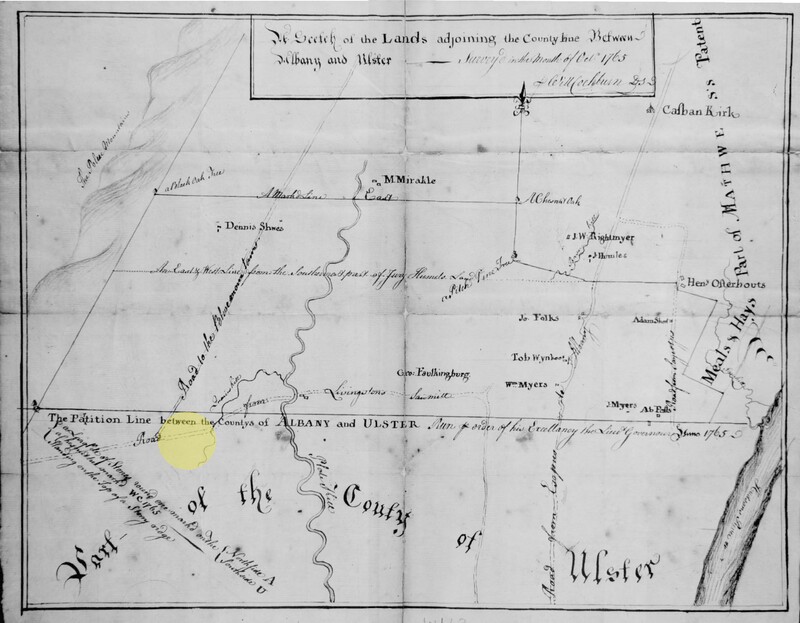 These bounds were not defined until an unrecorded deed, alluded to in the deed filed in 1792 to Robert R. Livingston, was surveyed to include all of what is today the village of Saugerties east of Partition Street, South of Main Street, and North of the Esopus, only excluding the land between Mynderse Lane and the Hudson from approximately 1000 feet south of the mouth of the Sawyerkill to the Esopus. The Livingstons immediately began to use this land and its access roads to influence both trade and investments. Their considerable land holdings, productive centers of manufacturing and related projects brought their involvement in the landings and the small, developing mercantile trade of Saugerties to the attention of those interested in the investment craze of the time: the construction of turnpikes. The function of turnpikes was to link water transportation systems by the shortest distance over land. Plans for improved roadways not only were good investments by themselves but also led to good investments in the land that was along their path. The Livingston road from Saugerties that went up the Beaverkill Clove and on to Shandaken was the most direct route from the Hudson River to the upper Esopus and from there to the upper Delaware and on to the Susquehanna River. Rival roads that used Catskill and Hudson as their terminus and took a longer northern route to the Susquehanna were to get the jump on Saugerties but in the 1790's the association of Livingstons and hubs of transportation activity found a ready focus of interest in Saugerties.